One of the most versatile polymer materials, polyurethanes have a unique chemical nature that allows for shaping and molding to fit all sorts of consumer and industrial products – seat cushions, carpets, insulation, coatings, and refrigerators to name a few. Despite its popular uses, polyurethane science has only relatively recently achieved appreciation for the richness of its expression as a polymer family. 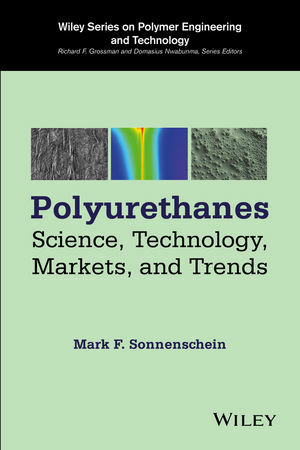 This book provides a thorough presentation of polyurethane science, technology markets and trend analysis based on recent patents. Although it does not provide ultimate detail (such as explicit information typically in patents), the book has a flow and continuity that allows readers to find all the background necessary to understand any other more detailed polyurethane information found elsewhere. Mark Sonnenschein is a Fellow in the Material Sciences Division at the Dow Chemical Company. He holds 36 US and international patents and is the author of over 50 refereed journal articles and the chapter “Polyurethanes” in Wiley’s Encyclopedia of Polymer Science and Technology.